A rally to support the striking nurses and midwives will be held in Dublin this weekend. The march will allow members of the public to "join the INMO protest" as thousands are expected to take to the streets in solidarity with those on strike across the country. Over 35,000 nurses and midwives voted overwhelmingly in favour of industrial action late last year. Their first 24-hour stoppage took place on January 30 with the second happening today on February 5. Further strikes are set to take place on six more dates this month - February 7, 12, 13, 14, 19, and 21. 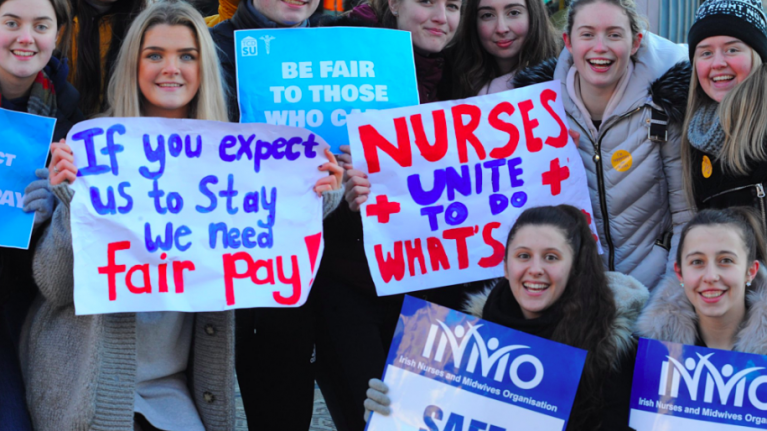 The Irish Nurses and Midwives Organisation has said that a solution cannot be met if the issue of pay continues to be ignored. The group are striking in protest of pay as well as staff retention and recruitment issues - much of which they say is caused by their wages. 240 hospitals and medical centres are affected by today's strike. This weekend's rally will take place on Saturday, February 9 at 12.30pm at the Garden of Remembrance. You can find out more about the rally here. Feature image via INMO Twitter. irish nurses and midwives organisation.